This Oumi Daijyo Fujiwara Tadahiro belongs to Jyojyo saku ranking. Shinto : Jyojyo saku ranking : Oowazamono cutting test ranking.Hizen province. Habakki : Silver double habaki. 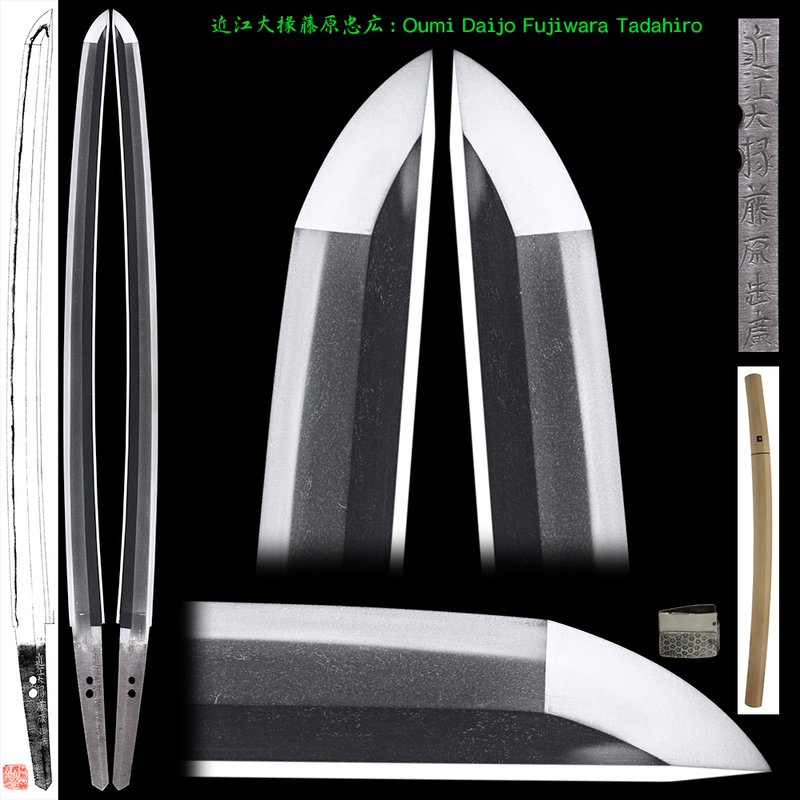 Blade length : 53.01 cm or 20.87 inches. Sori : 1.05 cm or 0.41 inches. Width at the Kissaki : 2.12 cm or 0.83 inches. Kasane : 0.6 cm or 0.23 inches. Era : Edo Kanbun period. 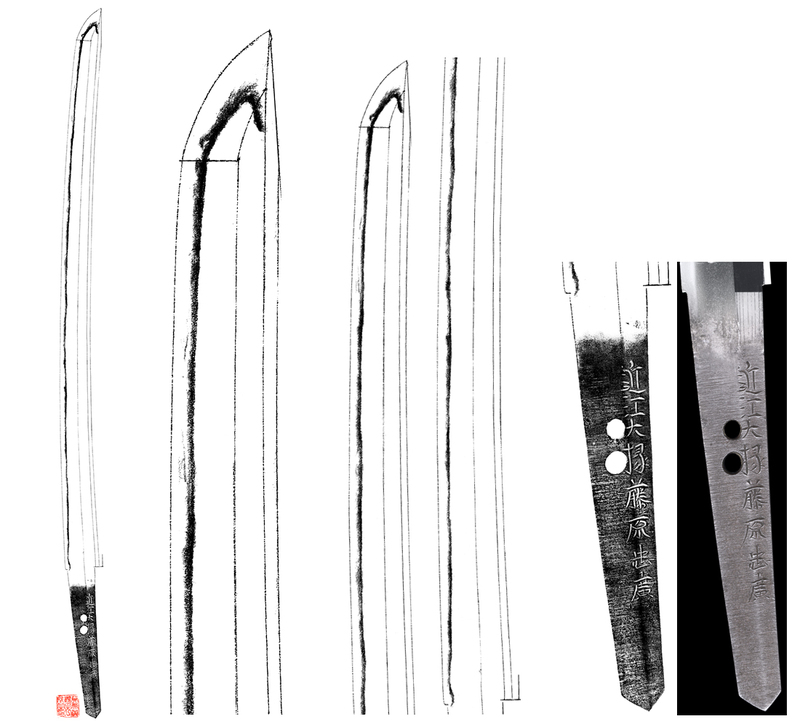 Shape : The blade is rather long size and rather long size, wide and thick healthy blade. Jitetsu : Koitame had well grayed with jinie attach and chikei work wonderful nice Jigane. Hamon : Niedeki Cyuーsuguha(middle suguha) Notare hamon with thick nioikuchi. 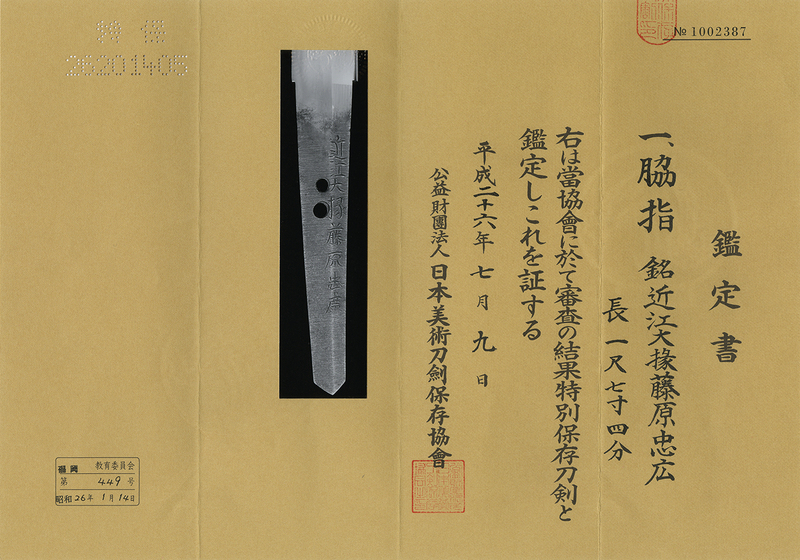 Special feature : Tadahiro the Second forged this katana. He was born Heisakuro Hashimoto as a legitimate son of Tadayoshi the First. Tadahiro was only 19 years old when his father passed away in1632 but he was enough skillful to forge sword at that time. but also supervised many students until his death in 1693, aged 80. He is known as a skillful swordsmith almost all works are above the standard hizen-to. He had been forged sword for a long period of time to leave the largest number of swords among the swordsmiths of Hizen school. He was good at both of Suguha-hamon and Gunome-midare Hamon. Especially the beauty of jitetsu called konuka-hada is appreciated as the best among the hizen-to. His swords are ranked at the Owaza-mono because of the sharpness. This blade is healthy and nice balanced nice work.